Our 30-day guarantee affirms that if a Member does not find value in their Undoctored Inner Circle membership within the first 30 days, they may email us to receive a 100% refund - NO QUESTIONS ASKED! Please email us contact.innercircle@undoctored.com to request your refund. Members may also unsubcribe to stop membership payments or resubscribe at anytime using the following steps. 1. 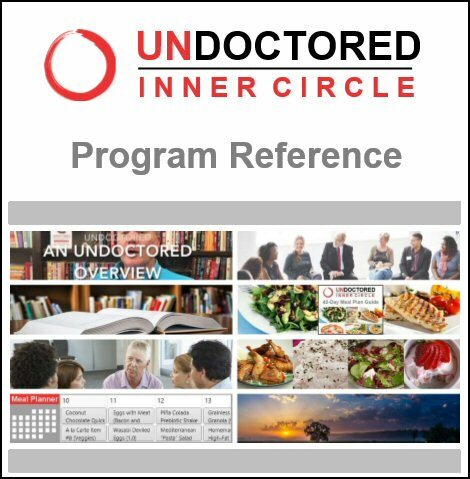 Log into your account at innercircle.undoctored.com. 2. Click the “My Account” link at the top of any page. 3. Click the “Update Credit Card or Cancel/Restore Membership” link on the navigation bar beneath the "My Account" heading. 4. Check the “Cancel Membership Payments” checkbox to deactivate your account. 5. Click the “Update Credit Card and/or Membership Status” button. The message “Your Credit Card changes have been saved” will appear in red at the top of the display. You may also reactivate your membership at your discretion by unchecking the “Cancel Membership Payments” checkbox and clicking the “Update Credit Card and/or Membership Status” button again.